New Delhi, 19 June 2017: Minister for Science & Technology Dr. Harshvardhan launched a Mobile App “Celebrating Yoga” developed by Department of Science & Technology, Ministry of Science & Technology in New Delhi today. The Mobile App has been developed by DST on the occasion of International Yoga Day 2017. 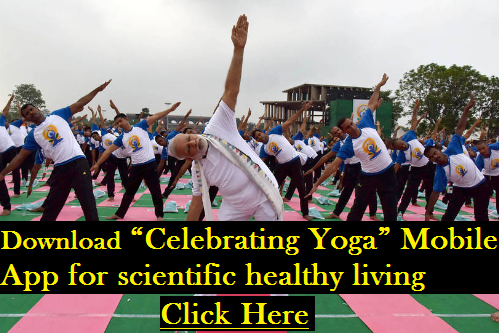 The purpose of the APP is to popularise Yoga and encourage people to participate in it for a scientifically healthy living. Healthy life of citizens improves productivity and economy of the country as a whole. Practicing Yoga is a means of maintaining a healthy society in harmony with nature and fulfil developmental aspirations. This aspect of quality of life is aligned with the National Mission “Swasth Bharat” of the Government of India. The Department of Science & Technology has launched a research programme “Science and Technology of Yoga and Meditation (SATYAM)” under its Cognitive Science Research Initiative (CSRI). As Yoga and Meditation are interdisciplinary endeavors that interface with Neuroscience, Medicine, Psychology, Engineering, Philosophy etc., YOGA can contribute in a holistic way to derive integrated benefits. Celebrating Yoga provides a platform to share information and insights about peoples’ participation in Yoga activities on the occasion of the International Yoga Day 2017; create awareness and encourage a scientifically healthy living. The App will enable in capturing both mass events being organized in public places, schools and office complexes across the country and individual enthusiasts who are performing yoga to promote the celebration of the day and yoga performances. The information gathered through this app will be shared subsequently with the Ministry of AYUSH to complement their efforts.